Monarch Watch is continuing to partner with Tribal Environmental Action for Monarchs (TEAM) and Tribal Alliance for Pollinators (TAP) on habitat restoration efforts in Oklahoma. TEAM is a coalition of seven Native American tribal nations (Chickasaw, Seminole, Citizen Potawatomi, Muscogee Creek, Osage, Miami and Eastern Shawnee) that are taking part in a three year comprehensive training program learning all aspects of habitat restoration and native plant production. Each one of the TEAM partner tribes pledged to plant 5,000 milkweeds and 4,000 native nectar plants on their tribal lands as a part of the program. TAP is a new organization that was created to share the best practices and training protocols developed by TEAM to a larger audience of tribal nations who are seeking technical assistance in restoring habitat for monarchs and pollinators. 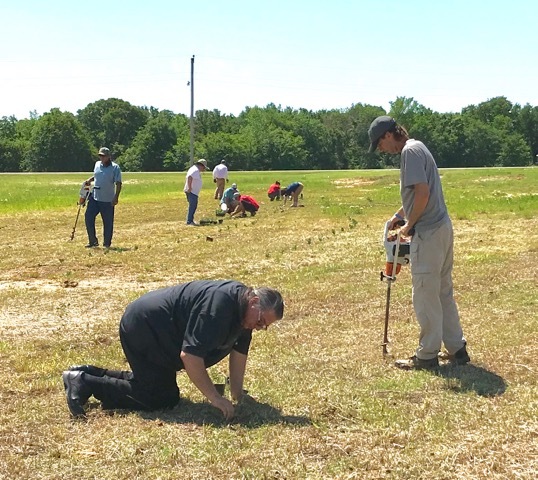 Seminole Nation Assistant Chief Lewis Johnson and Seminole Nation Parks and Wildlife Director Shane Phillips help to plant 1,500 milkweeds at the Mekusukey Mission restoration site on their tribal lands near Shawnee, Oklahoma, on May 25, 2018.